I will cut right to the chase as I’ve wasted enough time already enduring this so-called entry in the Die Hard canon. John Moore, director of such ‘memorable classics’ as The Omen (2006) and Max Payne, rides into the land of 20th Century Fox studios and takes the reigns of all things Die Hard, only to make the marginally decent fourth Die Hard look like the class-act original Die Hard. 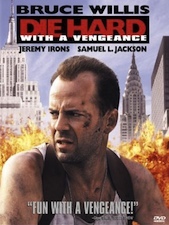 Moore’s 97-minute implosion stems from an anemic script by Skip Woods who seems to have written an entirely different protagonist, but simply swapped out a name for John McClane. Where do we find America’s favorite wrong place-wrong time cop, McClane (Bruce Willis)? He’s trotting about Moscow in an attempt to rescue his son, Jack (Jai Courtney), a CIA operative trying to extract an important Russian informant with a target on his back. In the midst of protecting said Russian man, the estranged father-son duo exchange shallow barbs with each other and fire machine guns in all directions. Jack’s mad at Daddy for not being around much. McClane doesn’t get it. Boo-hoo. Do you think the banter is ever as biting and fresh as what we got from Samuel L. Jackson and Willis in the third Die Hard? Heck, I would even take some Justin Long/Bruce Willis banter at this rate. 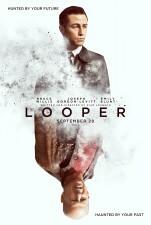 The studio and even Bruce Willis, himself, clearly had no intent to make a worthy installment. Seriously. The meeting for this movie went something like this. 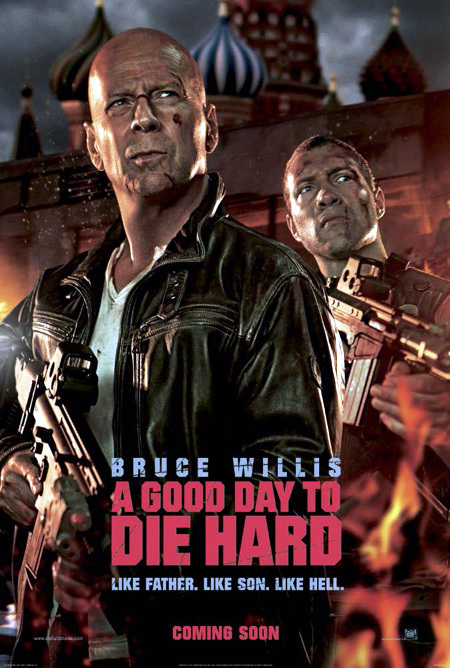 “We have an idea for a Die Hard slogan: Yippee Ki-Yay Mother Russia.” The studio executive says: “I love it. Perfect poster. Green light. Starting shooting tomorrow. Worry about the script when you’re halfway finished.” Willis jumps aboard and zones out the entire time. Mr. Willis clearly isn’t here to play his most famous character. He simply bobs around the international landscape taking a backseat to his son’s attempts at executing a plan. None of what makes McClane the hero we love exists in this lazy cash-grab featuring a nonsensically convoluted yet surprisingly thin plot that could fit through the eye of a needle. Honestly, the plot is so invisible, you will wonder for what reason all this mayhem took place when the end credits roll. Yes, we get all the insane action and violence the CGI budget of a $92 million production can offer. But McClane was never much for technology. Willis’ continually yells, “I’m on vacation!” Five times he repeats this. I kept yelling to myself—no you aren’t! You flew to Russia to save your son… What does that have to do with vacation?! I concluded the catchphrase was intended as foreshadowing regarding what Willis was going to do with his hefty paycheck. Consider this cash cow milked. 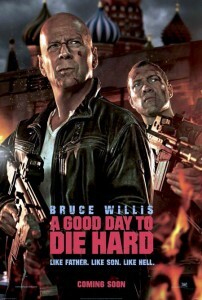 Having essentially re-invented the loose cannon archetype for a new generation with John McClane (the character Bruce Willis was born to play) in the original Die Hard, McTiernan returns to the franchise to direct its second sequel and in doing so injects a whole new meaning to the phrase “over the top”. After a string of middling successes following his early breakout triumphs of Die Hard and Predator, McTiernan went back to basics with the cop-versus-terrorists approach that worked so well seven years earlier. And what a trip is is. Vengeance is the most outlandish film in the series, and an experience that continues to up the tension and excitement with each act right up to the climactic Canadian finish. But the spectacle never gets ahead of itself, and McTiernan keeps things loose with a healthy dose of humor and genuine on-screen chemistry between Willis and his new sidekick Zeus Carver (a masterfully-cast Samuel L. Jackson, playing his character to the hilt). But while sizable portions of New York City end up as smoldering ruins, the focus is on the characters, not the action and explosions. A trick Michael Bay might want to try out sometime. 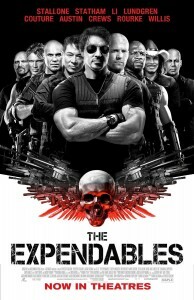 The movie starts with an explosion outside a department store, which sets in motion a series of events crafted by criminal mastermind Simon Gruber–brother of Hans Gruber, the financial would-be terrorist handily dispatched via defenestration at the hands of McClane in the original Die Hard. Naturally our favorite khaki-clad cop is at the center of it all, and is forced to jump through a series of hoops lest Mr. Gruber blow up more locales around the city. Rather than have him go it alone, though, he is joined by a perfectly mismatched foil in Zeus Carver, an angry electrician who has a bone to pick with nearly everyone in the city. Well, everyone who isn’t like him anyway. The pairing of Jackson and Willis is what lends Vengeance its true charm, as their constant bickering and insulting is as explosive as a pile of C4. Both reluctant heroes end up tearing through New York while being guided by the sinister hand of Gruber, who may or may not be using the entire act as a distraction for a much larger plan. 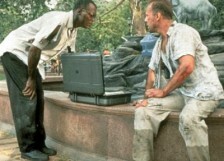 John McClane and his new BFF Zeus Carver take a break from busting heads to play some 7th Guest and Monkey Island. 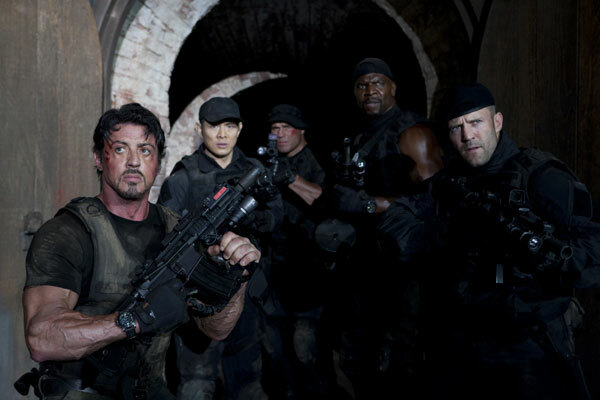 While the scale of the action gets continually ramped up throughout the film, there are times when things get a little too outlandish for their own good. I can handle subway explosions, high-speed car chases through crowded streets, and elevator shootouts just fine. But when refrigerator-sized (and shaped) plot devices appear out of thin air, or McClane literally surfs on the hood of a dump truck, things start to get a little silly. I think McTiernan was sort of going for broke, though, and as long as he was capping the Die Hard trilogy he was going to throw everything at the audience that was even remotely within the realm of metaphysical possibility. 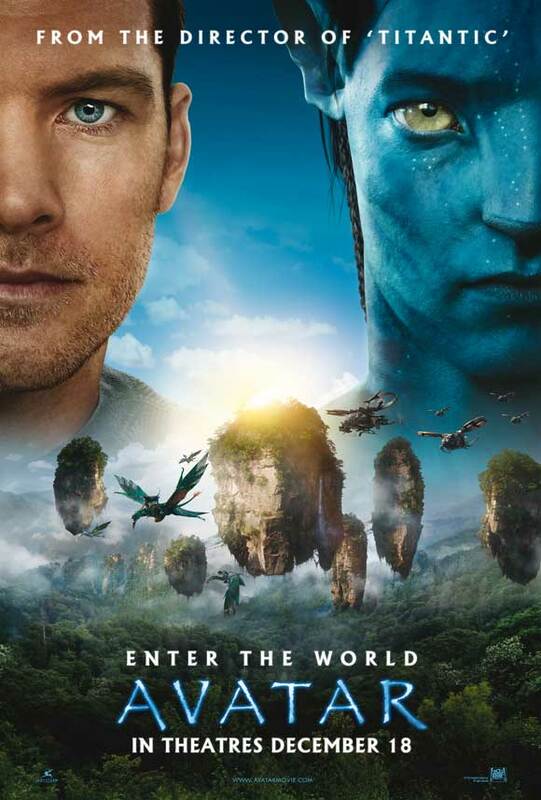 There is not one iota of plausibility in the entire film, but that’s not really the point. 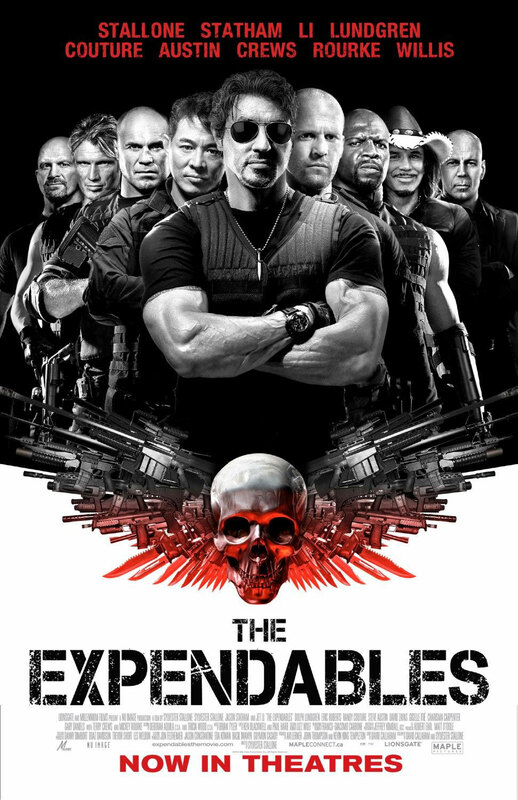 Vengeance is in many ways the culmination of 1980’s action movie excesses, and it knows it. One other troubling aspect of the film is the fact that the first half kind of wastes one of the most hardened, do-or-die action heroes ever committed to celluloid. McClane and Carver, as pawns in Gruber’s diabolical scheme (you can practically hear Jeremy Irons practicing his Evil Villain Laughter™ offscreen), spend the first hour demolishing the five boroughs while solving riddles and mind puzzles instead of actually fighting bad guys. Screenwriter Jonathan Hensleigh has said that the entire first hour of the film was taken directly from his original project with character names changed to fit the Die Hard series, and while the action is still as explosive as ever, it does feel out of place for a Die Hard film. Even so, action film junkies need to look no further for a liberal dose of adrenaline. Bruce Willis has spent a lot of his career kicking in doors, but I bet this is the first time he’s had to do it just to get his wife out of bed. 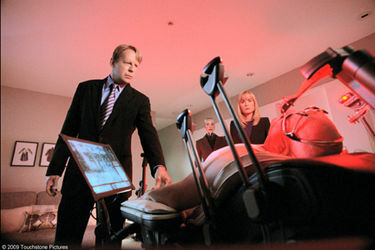 Surrogates is a disturbing story of man kind’s dependence on technology and susceptibility to control by fear. In the not-too-distant future, mid-Sunday A.D., 98% of all humans live vicariously through life-like robots. They lie in chairs that look like the offspring of a La-Z-Boy and a virtual reality entertainment center (“stem chairs”), and rarely leave their homes. Their work, and all other interaction, is done by their “surrogates,” androids connected to their brain stems. You may, of course, choose your own “surry.” You can be whatever gender, race, body type, or hair color strikes your fancy. It’s sort of a universal Stepford Wives. You see what your surry sees, and feel what it feels (except the pain, of course). In the future, all murder scenes will look like this. Greer plugs into a stem chair. Greer has bigger problems, however, because early in the movie, what starts as a routine vandalism investigation (below), soon appears to be a double homicide – the first two homicides in the western world in several years. It seems that someone has developed a weapon capable of sending a signal through a surry that not only destroys the surry, but liquefies the brain of the user. Robocop meets CSI. Got enough crackers for all that cheese? The initial theory is that this is subversive action by “Dreddies,” members of a colony where surrogates are outlawed. 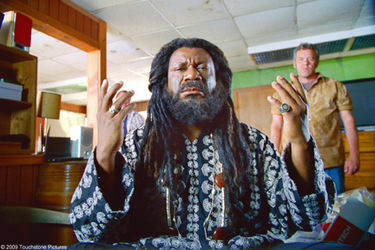 The Dreddies follow the leadership of “The Prophet” (Ving Rhames, below), claim sovereignty over a small patch of ground, and spurn all advanced technology, using horses and buggies, and the like. Ving Rhames, trying way too hard. Would you tell this it wasn't your wife? Some guys are just never happy. Willis could have earned a lot of kudos for this film if he’d allowed the makeup department to make his human self ugly. It appears however, that his agent fought not to lower his image one bit. Everyone else is hideous, giving a realistic portrayal of people who haven’t shaved, showered or brushed their teeth for several days. Willis’ acting is passable. His most memorable scene is probably one where he begs his wife, through the eyes of her surry, (Rosamund Pike) to let him see her again (above). The best acting in the movie is probably done by Rhada Mitchell, as the blond, buxom surry of Greer’s homely (work) partner, Peters. I say this because this surry is taken over by several different people in the course of the movie, so she’s always switching characters. She also gets a scene where she runs at incredible speed through the street, doing flips over cars, and so forth. Which raises a question that the movie never resolves: if the streets are now populated with super-strong, super-fast robots, why are there still so many cars? It’s hard to say more without spoiling a decent flick. 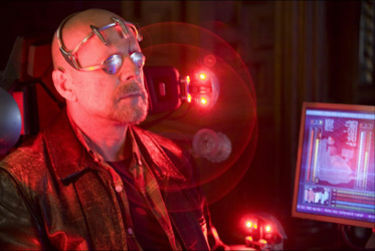 I’ll just say if you like sci-fi, or crime stories, Surrogates is worth a look. Not a classic, but exciting, involving and thought-provoking.